Serenity Hardscapes LLC can offer you a personalized design that fits your family’s needs. There are several steps throughout the entire process, and the first is the design. This is the point in which one of our designers will meet with you for a free consultation and discuss your ideas. We will then measure your property and start the design! When we come to measure your house, we will review all drainage issues, style of the house, and the surrounding scenery to help with the style of the design. Once the design is finished, the designer will schedule a time to meet with you to present the design ideas and pricing. After the design and cost have been finalized, Serenity Hardscapes will start on the construction process. On average, a project will take 6 to 8 weeks to construct, however, this is dependent upon the size of the project as well as the weather conditions. The first step in the construction process is getting the property marked for any utilities that pass through the yard. Then the designer will paint the layout of the pool and we will begin the digging process. After the pool has been dug, we will install all the form work for the pool followed by all the necessary drains and piping that the pool will require for operation. At that time, we will install the rebar, which is a very important step, as this is the main structure that holds the pool together. Once all of the rebar has been installed in the pool, we will shoot the gunite into the pool and carve it to the shape desired. As soon as the pool has been shot with gunite, we will remove all forming material and grade around the pool. We will then install all the necessary plumbing and electrical piping. Serenity Hardscapes is a proedge builder who uses top of the line Jandy equipment on all of the pools it constructs. Once all the plumbing and electrical piping has been installed and inspected by your local code enforcement agency, we will cover all ditches and grade the property. This is the time for tile and coping, in which we have a wide variety for your selection. First, we install the tile, located at the waterline. We then install the coping which outlines the edge of the pool. The coping can be a wide range of material such as brick, stone, limestone, or concrete. After the tile and coping have been installed, we will add in any attractions, such as waterfalls, sheer descents, fire bowls, etc., that might be around the pool. During this part of the process we will install any additional stone in and around the pool. After all the stone has been completed we will be ready to pour the pool deck. There are several styles for you to choose from such as different types of pea rock, stamped and stained concrete, and flagstone. You could also choose a combination of two. After the deck, stone, and any additional retaining walls have been completed, we can start on the landscaping. This is a very important part of the project, as this helps to bring out the full beauty of the pool and it’s surroundings. The landscaping process includes installation of all necessary drainage and any fencing that is required. Once we have fully completed the pool and its surroundings, we will be ready for plaster! Serenity Hardscapes LLC offers a wide range of plaster finishes and colors. During the design process we will make recommendations on which color to use as well as which product. As soon as the pool has been plastered, it will be filled with water, which typically takes around 24 hours. After the pool is filled, we will get the pumps and filters up and running, and will maintain it until we have all the chemicals balanced and the pool has been completely finished. Once we have completed the entire project, we will perform pool school, a meeting in which one of our service technicians will teach you proper pool maintenance and care. You will also be receiving all of the proper owners manuals and instructions on our pool equipment. 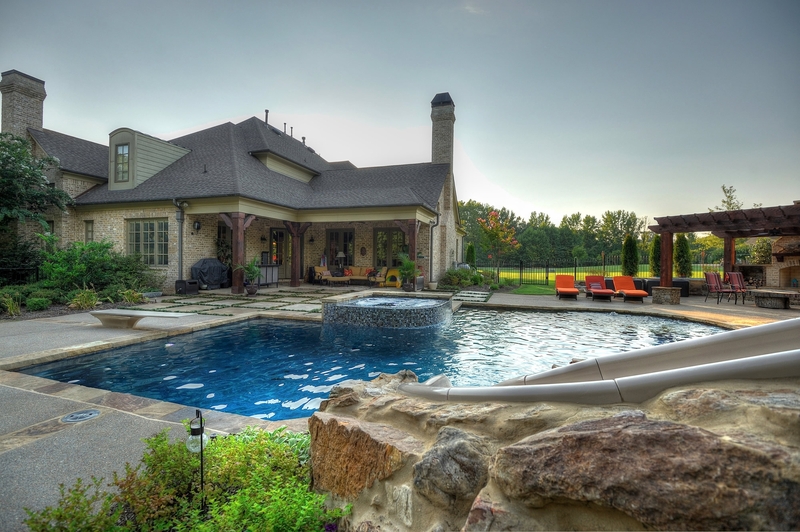 At this time the pool is handed over to the homeowner and it is yours to enjoy! Serenity Hardscapes LLC strives on its customer service and prides itself in taking a construction project to a personal level. We are a company built on quality, allowing your project to be handled with extreme care from start to finish. Serenity did an excellent job and were wonderful to work with. Quality of work was outstanding. Added on to original work they did and it looked like it was all done at the same time. They stayed on schedule with the work promised. I would highly recommend Serenity.